Expedition 39 primary crew flight engineer Steve Swanson of NASA, Soyuz commander Aleksander Skvortsov of the Russian Federal Space Agency, Roscosmos, flight engineer Oleg Artemyev of Roscosmos are seen in quarantine, behind glass, during the final press conference be Monday, March 24, 2014, at the Cosmonaut Hotel in Baikonur, Kazakhstan. The mission is set to launch March 26 from the Baikonur Cosmodrome. The tense political relationship between the United States and Russia will not affect the planned launch of a NASA astronaut and two cosmonauts to the International Space Station Tuesday (March 25), NASA officials reiterated last week. The situation in the Ukraine has led to heightened tensions between Russia and the United States recently. Russian President Vladimir Putin annexed Crimea, a region of the Ukraine, making the peninsula a part of Russia on Friday (March 21). President Barack Obama and other world leaders have condemned Putin's decision, bringing sanctions against Russia in response. "We have a great relationship with all of our international partners, and the crew is focused on launch," Byerly told Space.com. Since the end of NASA's space shuttle program, the agency has relied on Russia's Soyuz spacecraft to ferry astronauts to and from the space station. By 2017, NASA officials hope to start using private spacecraft now under development in the United States to deliver astronauts to orbit. International cooperation plays a huge role in the space station program, Mike Fossum, deputy director of flight crew operations for the International Space Station, said during an interview on March 23. "I think the international cooperation of the 15 nations we have participating in the International Space Station program is really important," Fossum said. "It's great as we share our resources from the different countries, our skills and our teamwork, our experience come together to make these kinds of things happen. It's important to us now to have the Russian Soyuz spacecraft as our way of getting people to and from the International Space Station." The space station program has weathered international conflicts before, NASA chief Charlie Bolden has said. "I think people lose track of the fact that we have occupied the International Space Station now for 13 consecutive years uninterrupted, and that has been through multiple international crises," Bolden said during a news conference on March 4. "I don't think it's an insignificant fact that we're starting to see a number of people with the idea that the International Space Station be nominated for the Nobel Peace Prize," he added. "It's not trivial. It has continued to exist and continued to function with people from a variety of cultures and beliefs, but we all are focused on the mission of the International Space Station." 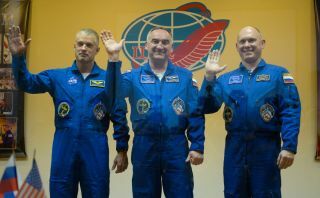 Swanson, Skvortsov and Artemyev are scheduled to launch from Baikonur Cosmodrome in the Central Asian country of Kazakhstan at 5:17 p.m. EDT (2117 GMT) on March 25.